As it says in Rev. 12:1-10, “A great sign appeared in the sky, a woman clothed with the sun, with the moon beneath her feet. 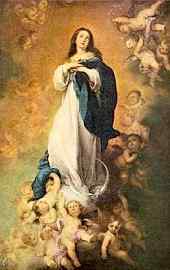 Because Mary was full of grace, she overcame all temptations to sin. When she reached the end of her earthly life, her full level of holiness enabled her to immediately receive her glorified body, i.e., the restored unaffected-by-sin body like we shall all receive at the Second Coming of Christ. Because Mary did not succumb to death by sinning, her flesh never lost its eternal life, and thus she was “assumed” or transferred bodily to heaven. May her example of holiness assist us in our journey toward heaven. Let us ask her to share with us the grace that helped her to resist sin.